Some thirty-two experts from fifteen countries join three of the world's leading authorities on the design, manufacture, performance and history of brass musical instruments in this first major encyclopaedia on the subject. 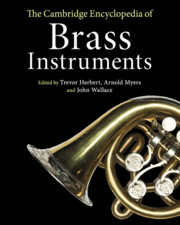 It includes over one hundred illustrations, and gives attention to every brass instrument which has been regularly used, with information about the way they are played, the uses to which they have been put, and the importance they have had in classical music, sacred rituals, popular music, jazz, brass bands and the bands of the military. There are specialist entries covering every inhabited region of the globe and essays on the methods that experts have used to study and understand brass instruments. The encyclopaedia spans the entire period from antiquity to modern times, with new and unfamiliar material that takes advantage of the latest research. From Abblasen to Zorsi Trombetta da Modon, this is the definitive guide for students, academics, musicians and music lovers.